This past weekend was Labor Day weekend, and a few of us decided to we were craving a quintessential, summer day of swimming, grilling, and summer fruit, especially because it’s been so hot lately. That’s pretty much all we had planned until about noon on Sunday, but somehow everything came together for a perfect summer getaway that included bridges, beers, and bears! 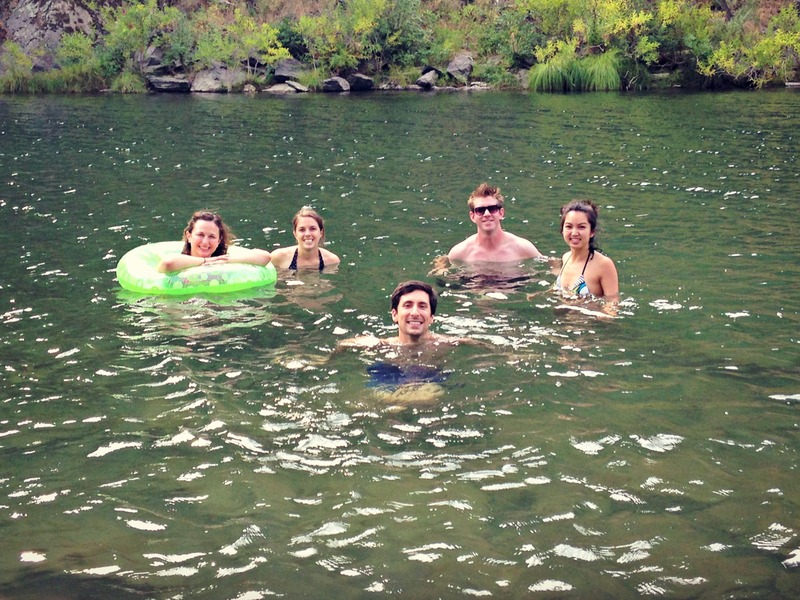 We met up with Kelsey and Dylan at their place in Davis and made last minute plans from there to head to Clarks Pool on the American River in Auburn, CA. We left armed with snacks and beers from Kelsey’s favorite Davis establishment: Nugget Market! (She’s actually been known to give tours of Nugget). After parking at the trail head, there’s a short walk/hike of about .75 miles along the river to Clarks Pool. We debated as to whether this could truly be considered a Hiking Club excursion, since three of us were actually in flip-flops, and Paul forgot his camera. C’mon Paul, shirking responsibilities already! 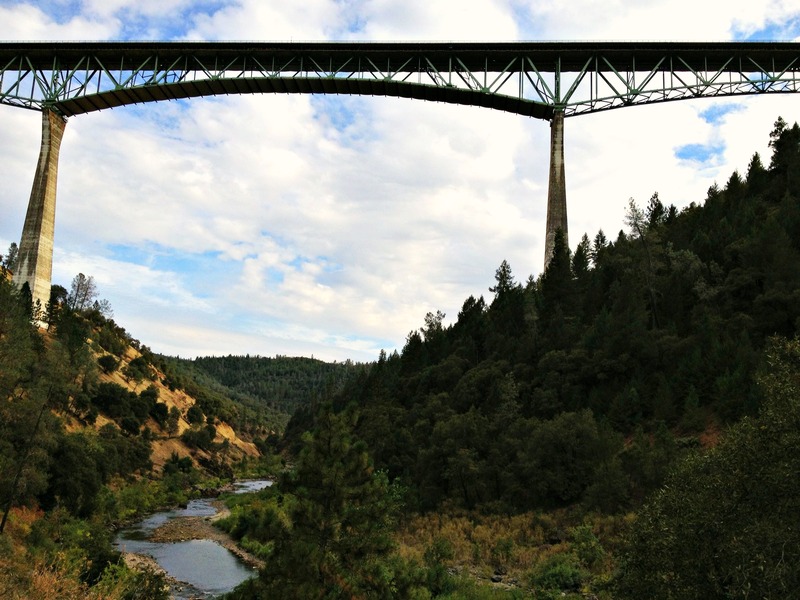 The pool itself is more like a widened area of the river that’s dramatically located under the highest bridge in California, the Foresthill Bridge. We easily found a relatively secluded area to post-up, and a few of us hopped right in while Jarrett began blowing up his floatie. Yep, he brought his floatie inner tube, and everyone was appropriately jealous. The riverbed is relatively shallow at parts, but for risk takers, there is a deeper area beneath a large rock where people were exercising their jumping skills. 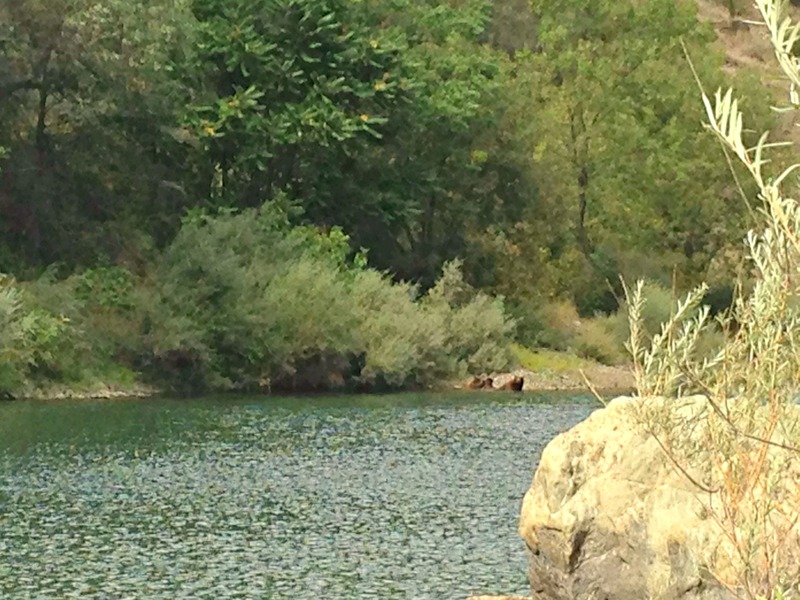 As we were swimming downstream, Manal called us back because about 60 yards upstream, there were THREE BEARS, playing in the water. SO. COOL. The last time this group saw a bear in the wild was about three years ago in Yosemite. Manal was able to grab this shot the bear family! It was unexpected to see bears in that area, and to swim with them in the same river at such close proximity felt surreal. Since two were much smaller than the third, we guessed the trio consisted of a mother bear with her two cubs. After some simple Google sleuthing, I found that the dry winter and warm summer were driving bears outside their normal territories in search for food. Good luck, bears! The rest of the day involved me deviously splashing Paul as he attempted to slowly adjust to the water, then Dylan shoving me all the way in the river. It’s not really a water day until someone gets dunked, right? Manal snagged this shot of gang escaping the mid-day heat and Sarah taking advantage of the famous floatie. 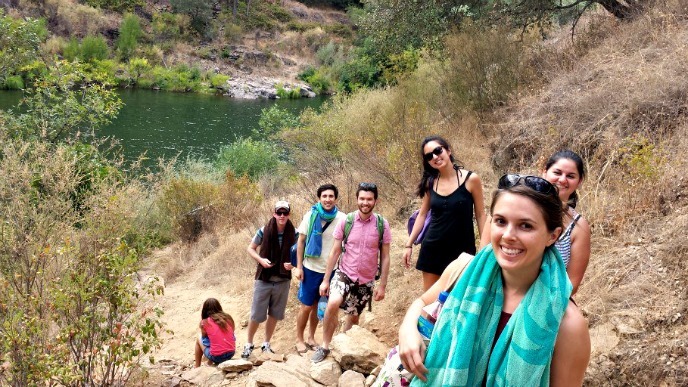 Sarah luckily got this shot that forever memorializes Dylan’s awesome, Euro-fabulous towel attire. If I’m not mistaken Fall Fashion Week begins today in New York. Dylan, are you trying to tell us this is what’s hot on the runways this season? After returning to Davis, we fired up the grill and crafted some homemade hamburger patties, kebabs, sausages, and a strawberry crumble for dessert. We enjoyed the warm, Davis evening under the stars on an outdoor deck, and I was feeling pretty lucky. I’ve known Kelsey and Jarrett since our Freshman year at Cal (Go Bears!) and met everyone else shortly thereafter; in fact, Kelsey was my roommate that year, and Jarrett lived just down the stairs from us. It’s pretty awesome to see how we’ve all gotten to know and grow with each other over the past eight years. Overall, we had an absolutely perfect day that was hardly planned and just all came together perfectly in the end. Hope everyone had a relaxing Labor Day weekend!